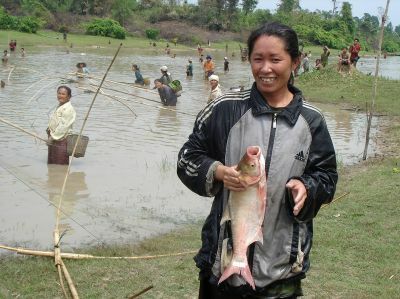 Harvesting a communal culture-based fishery in Thong Van, Vietnam. Simple technology that is easy for farming communities to learn and adopt. Very low capital costs, making use of existing infrastructure and natural productivity. Contributes to the income, food security and nutritional status of rural communities. Suitable for implementation as a communal activity. Sustainable, very low greenhouse gas emission food production, with no external power or feed inputs. How can I develop a culture-based fishery? This manual provides an overview of the major steps to be taken into consideration in developing a culture-based fishery including community consultations, selection of water bodies and suitable species, guidelines on preparation and stocking, harvesting strategies, marketing and security. The manual is aimed to provide guidance to extension workers and farmer communities on integration of CBF into rural development plans or agricultural crop calendars. Case studies on the development of CBF in Sri Lanka and Vietnam are also presented. This book is the proceedings of the Regional Consultation on Culture-Based Fisheries Development in Asia, held in Siem Reap, Cambodia, 21-23 October 2014. It provides a general overview of key issues in CBF, selected case studies of CBF development throughout the region including for Lao PDR, Cambodia, Sri Lanka, Indonesia, Thailand and China. A reference list of publications that have arisen from ACIAR-funded CBF projects over the last twenty years is also provided. Video recordings of the technical presentations from this consultation are also available for viewing online or download from the Podcast section of the website. Since 2015 NACA has been implementing a project to introduce culture-based fisheries practices to Cambodia, working with communities around twenty-four small inland water bodies in six provinces circumnavigating the Great Lake (Tonle Sap). The project is funded by the Australian Centre for International Agricultural Research (ACIAR). It builds on an earlier phase that aimed to consolidate CBF in Lao PDR, developing strategies to optimise the benefits under varying social, climatic and regulatory circumstances.